If you are looking for fun family things to do in South Carolina’s Midlands, Lever Farms is the answer! A fall visit to the farm provides opportunities for making cherished family memories. We are open every Saturday in October from 10am to 5pm. Come and pick your own pumpkin, navigate our corn maze, take an educational wagon ride, see our farm animals, play some of our farm games and much more. We also have picnic tables set up for you to bring a lunch and enjoy a beautiful fall day in the country. You will be sure to have a fun filled day full of adventure on the farm. Relax and rock your cares away on our porch. Sit and enjoy our delicious Pumpkin Fritters and refreshing Apple Cider Slushies. Take home some of our tasty Old Fashion Apple Butter and Pumpkin Butter with Honey, or Lever Farms raised meats -- so don’t forget your cooler. 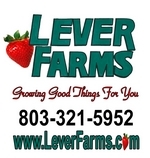 Come experience the fall season at Lever Farms located just a short country drive from Chapin/Irmo/Columbia. Near Columbia/Irmo/Chapin: Take I-26 (Exit 74). Turn Right onto SC Highway 34 towards Winnsboro. We are located 7.5 miles from I-26 on the left. Near Spartanburg/Laurens/Clinton: Take I-26 (Exit 74). Turn Left onto SC Highway 34 towards Winnsboro. We are located 7.5 miles from I-26 on the left.